Over fertilization with nitrogen (N) is considered the main driver of agricultural soil acidification in China. However, the contribution of this driver compared to other causes of soil acidification on intensive croplands has seldom been quantified under field conditions. We measured the fate of major nutrients, and calculated the related H+ production, based on the difference between inputs and leaching losses of those nutrients for a wheat-maize rotation system on a moderate acid silty clay loam soil in a two-year field experiment. Topsoil pH decreased 0.3 units in the plots with conventional (current farmer practice) high N fertilization after two years, with a proton production of 13.1 keq H+ ha−1 yr.−1. No apparent changes in topsoil pH were observed in the plots without N application, in spite of a proton production of 4.7 keq H+ ha−1 yr.−1. Crop uptake was the primary driver of H+ production, followed by N transformation processes and HCO3− leaching in both plots. 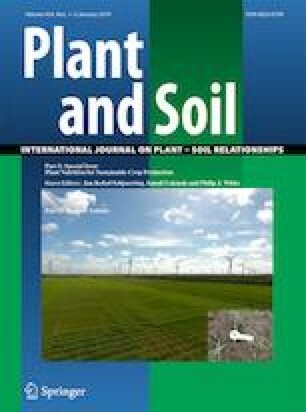 Nitrogen fertilization had a relative small direct impact on soil acidification due to a very limited nitrate leaching, induced by large N losses to air by denitrification in this specific moderately acid soil, whereas elevated base cation uptake by crops induced by N fertilization indirectly had a relative large impact. The online version of this article ( https://doi.org/10.1007/s11104-018-3760-0) contains supplementary material, which is available to authorized users. This work was financially supported by the State Key Basic Research Programme (2017YFD0200101), the National Natural Science Foundation of China (41425007 and 31421092), China Ten-thousand Talent Programs (Liu X.J. ), the Sino-UK Nitrogen Project (CINAg) and Sino-Netherlands cooperative project (grant 13CDP009).